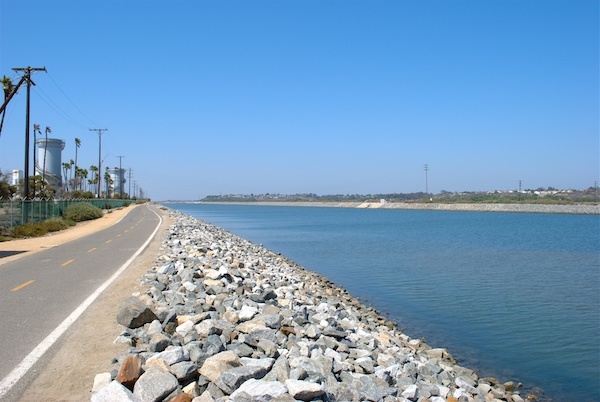 The Santa Ana River trail is a multi-use recreational trail that runs for 30 miles along the Santa Ana River, from Huntington Beach to the Orange/Riverside county line. It is a paved path, 12-feet wide, popular with walkers, runners, and cyclists. It has become a popular bike commuting corridor. It’s a good path for running, but be aware on a hot day as there is little shade. For most of the way, there is a trail on both sides of the river — usually one side is paved and the other dirt. There are mile markers. The trail starts in Huntington Beach at the intersection of the Huntington Beach Bike Trail, and goes through the cities of Costa Mesa, Fountain Valley and Santa Ana. There are several entry points to get onto the trail and several city and regional parks. The information link has detailed descriptions of the various sections of the trail. A nice section is the 3 miles on the south side of the river, along the Banning Channel Bikeway, east to Adams Ave., passing through Talbert Regional Park and Fairview Park (which itself has a few miles of trails). In the Garden Grove/Orange area, look for the “A” in the distance, as you go through Anaheim you’ll see Angel Stadium and the Honda Center a little bit after this, the trail starts to head east, then it will take you into Yorba Linda and Anaheim Hills, before it will end at Green River Road in Corona, just after the beginning of Riverside County. Note: There have been reports of significant homeless encampments along sections of the trail. Up to 30 miles, one-way.